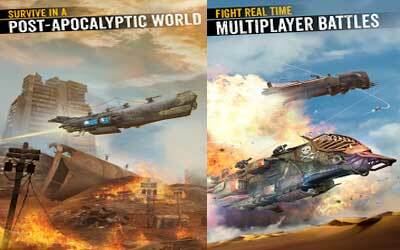 Sandstorm: Pirate Wars APK 1.18.9 is one of the best and recommended games to spend your free time. You will be able to find this addictive game under the adventure game category on Google Play Store. Ubisoft Entertainment is a famous game developer which produces plenty of games. They are playable in different console. This game is one of the Android-based games developed by Ubisoft. It incorporates in-app purchases as an option for gamers who want to speed up the gaming process. Although it is straightforward and exciting, some people are having difficulty playing it. In this article, we will not only discuss about the specification of this game, but also the gameplay as well. As it goes with any modern adventure game, the gameplay starts with introduction. It brings you to post-apocalyptic era where most of world surfaces are covered with desert. The desert is filled with mutant scavengers that live coexistence with fearsome pirates. In the game, you will play as a captain of flying sand cruiser battleship. You need to survive from various dangerous places on the world including polluted map, nuclear fallout, and wasteland caused by war. In order to do so, you need to upgrade your battleship with powerful weaponry. Drones, cannon, laser, and mini gun are available for your battleship. After obtaining some of those weapons, you need to place it strategically in your battleship. The placement of those weapons might determine the outcome of the war. You need a perfect tactics to defeat your opponents. Your battlefield is customable. Therefore, you do not need to be worried with the appearance of it. Since it features leaderboard system, you can play the game with your friend. After completing certain task, you will obtain achievement for it. If you have difficulty to find a game for your free time, you can always play Sandstorm: Pirate Wars for Android. Faction Wars – Choose your side, ally with other players, and battle for dominance in this brand new co-op mode! Further Customization – 10 extra Ship Parts and 2 brutal new Skins! More challenging missions, exciting locations, intriguing characters and savage enemies!